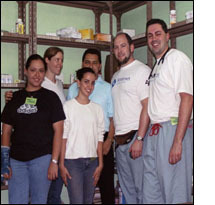 In March 2004, Dr. Richard Paris, a 1996 of the Overlook Family Practice Residency, joined a mission team to La Entrada, Honduras, where he and several other physicians and nurses spent two weeks providing medical care in the Public Health Clinic and surrounding villages. The program, called Hearts for Honduras, is sponsored by the Liberty Corner Presbyterian Church, which opened a school in Honduras in 2000 and provides ongoing support to the villagers. Dr Paris partnered with local physicians by helping them treat their patients with limited equipment and resources. He also did a cultural exchange Continuing Medical Education Program, in which he gave a presentation on addiction medicine and they did a reciprocal program on tropical diseases. The group stocked the local physicians' offices with medicines, they conducted a women's health screening, and led a community-based cancer program for civic leaders. In return, Richard and his colleagues received a life-altering perspective about medical care. "In the U.S., we conduct a multitude of tests and follow specific treatment protocols, commented Richard. "When those resources are absent, you change your priorities and make different judgments. For example, we'd advise asthma patients in Honduras to alleviate their symptoms first by venting open fires out of their homes through a chimney and installing concrete over their dusty dirt floors." According to Richard, providing medical care to the rural villagers of LaEntrada was a powerful experience�so powerful that's he's going back this year. "The experience brought it all home," he reflected. "It reinforced why I became a family doctor in the first place."